Last week in Parliament our PM made a speech that got the country and, seemingly, even the world talking. It's essentially a 15 minute attack on the leader of the Opposition, Tony Abbott and his hypocrisy relating to sexist phone messages sent by the now former Chair of the House, Peter Slipper. You can watch the entire speech below. One could argue Tony had it coming but if he was any good as an opposition leader it would never have come to this in the first place. Tony lacks the vision to see where his leadership is going. He seems to lead in the moment, taking every opportunity to construct a sound grab for the media without really comprehending how everything flows on and works together as a whole. If he hadn't gone on the attack with demanding Peter Slipper's resignation, and tried to take the high moral ground on sexism, he wouldn't have needed to have his wife front up to every talk show trying to convince everyone (yet again) he's really a nice, female friendly guy (though any excuse the media has to re-run that vision of his three adult age daughters in bikinis playing with Tony in their backyard pool is okay with me). 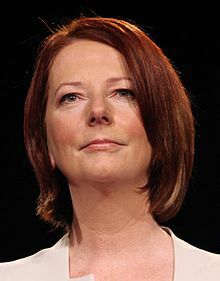 However, back to Julia Gillard and her speech. Personally the content of it is irrelevant to me. We already have laws about this kind of behavior and no one was questioning the content of Peter Slipper's text messages. What struck me about the speech is that Julia actually sounds like she meant what she said and said what she meant. In short, she sounds like a leader. If Julia gave speeches with this much conviction all the time I'd have more confidence in her as a leader. She reminds me a lot of former leader of the opposition John Hewson, who currently is an excellent political commentator, but as a leader of his party he always seemed hamstrung by party advisers instead of believing in himself and his own instincts. Hewson started sounding like a leader again the day after he resigned as leader of his party. The thing is, from what I've seen of Julia, she's anything but measured or wishy washy. She can think on her feet much faster than Tony Abbott can and should be running rings around him in any discussion. She can be every bit as brash and scathing as her Labor predecessors, Paul Keating and even Bob Hawke, yet she seems to concern herself with ensuring she says everything in politically correct, non offensive terms. Former PM, Kevin Rudd was a bit the same way. Perhaps that's why people are yet again speculating about returning him to the Labor leadership... they won't gain anything but they won't lose anything either. Both leaders are a bit... 'Meh'. Julia has the capacity to be a great and memorable leader. If her party advisers allowed her to take a few more risks and were more willing to follow her to the edge. She'd be unstoppable. As things are now, she's probably going to become a great political commentator when she loses the leadership - whether that be at an election or through yet another party leadership challenge.